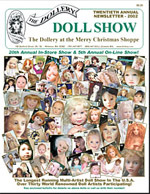 Call Kim at 781-447-6677 or email kmalone@dollery.com for information regarding these dolls. 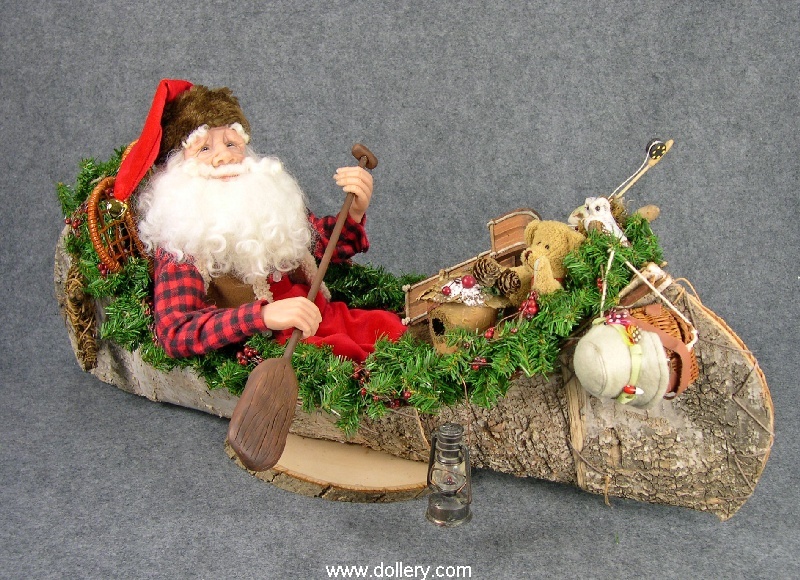 Explorer Santa is seated in a hand made birch bark canoe and comes complete with outdoor accessories. He wears a black check shirt with Sherpa vest, velvet trousers and hat trimmed in real fur. He has blue glass eyes and wool beard. Polymer clay hand sculpted faces with resin hands. 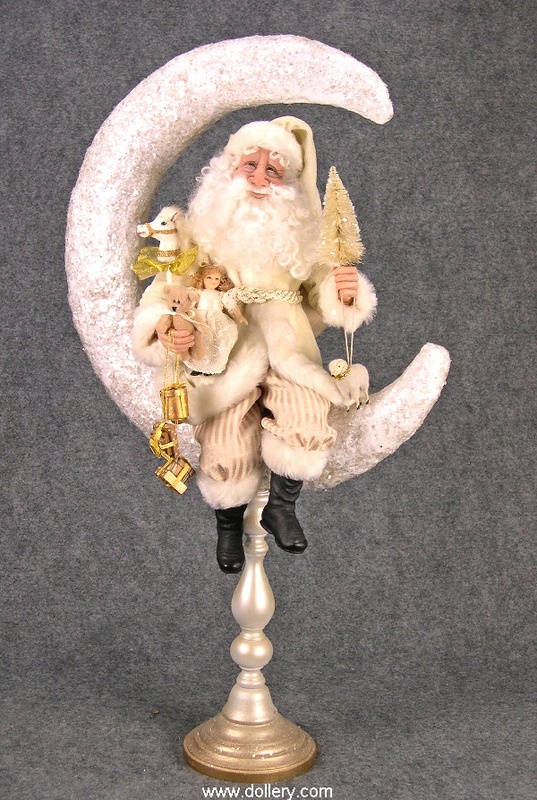 Night Sky Santa is dressed in an ivory velvet coat and striped trousers trimmed in faux fur. 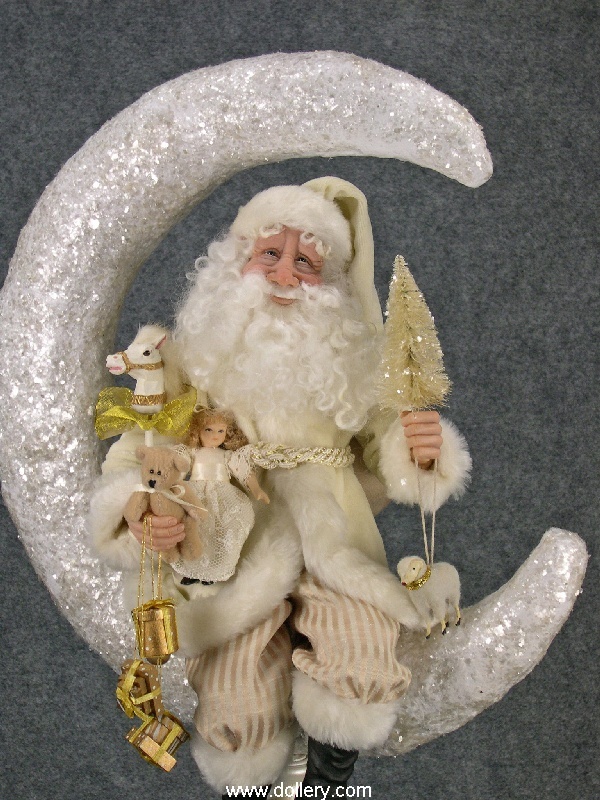 He comes complete seated on his moon with mica flakes hand made by the artist. He has blue glass eyes and a wool beard. Polymer clay hand sculpted faces with resin hands. Diane at our 2007 Show! Making Tracks (below) $995 SOLD! Santa has traded in his sleigh for a bear ride. Making tracks to deliver all the gifts, Santa rides a brown bear. Hand sculpted polymer clay face, blue glass eyes, wool beard and resin hands. 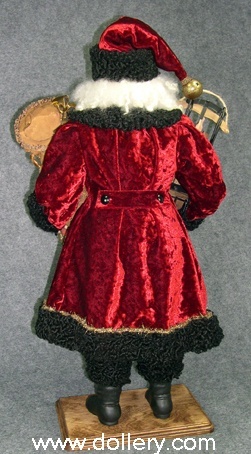 Santa wears a red and green plaid coat trimmed in brown fur. 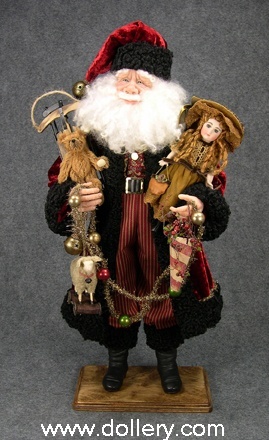 He holds a sled, boat, doll, bear, ice skates, wooden skis and over his shoulder is a brass horn. 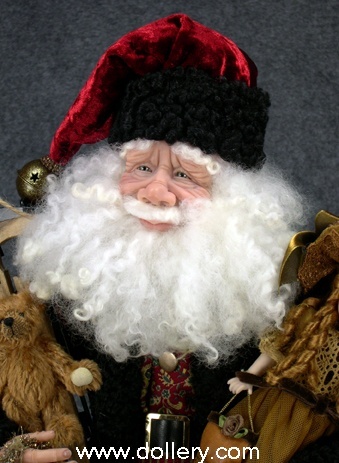 This 26" Santa has a handsculpted polymer clay face with blue glass eyes, resin hands and Tibetan lamb beard. He is sitting on a handmade reproduction rocking horse. The total height of this piece is approximately 34". He is dressed in a tapestry coat trimmed in a tassel fringe combination and green velvet trousers. His hat, coat sleeves and boots are trimmed in mink. 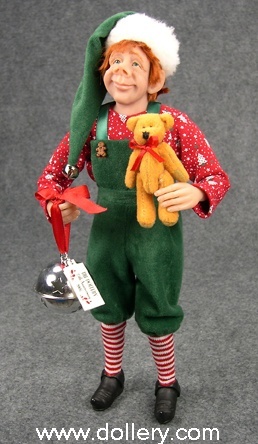 He holds a porcelain doll, teddy bear, drum, horn and gift box ornament. The gift box ornament can be opened to place a special gift in. 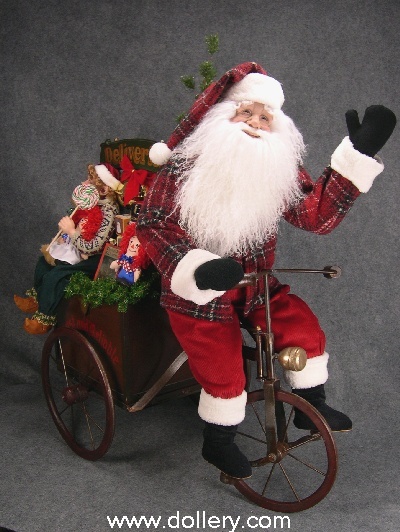 Santa waves to everyone as he rides his delivery cart filled with toys. Santa has blue eyes and a Tibetan wool beard. He wears a black and red Berber fleece coat trimmed in faux fur and red corduroy trousers. The elf is seated in the back of the cart. He has green eyes and is dressed in a sweater and trousers. 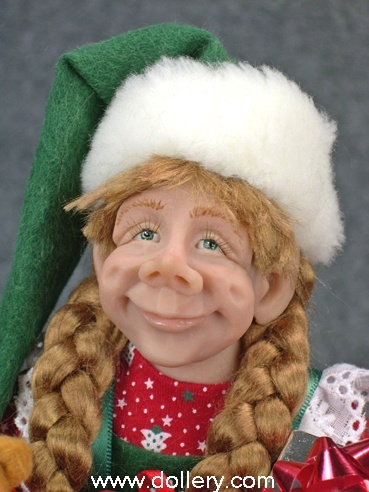 Created especially for The Dollery's 25th Anniversary are eight One-Of-A-Kind Elves by artist Diane Troutman. 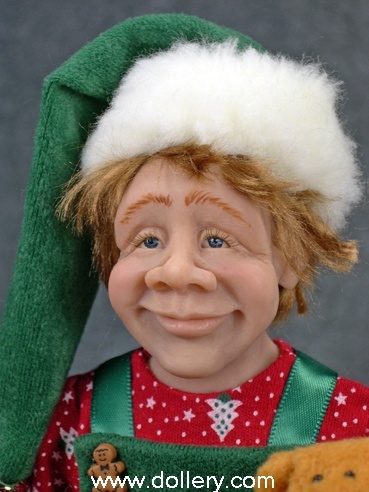 Each Elf has a handsculpted polymer clay face with hand painted eyes, resin hands and shoes and viscose hair. They have posable arms and legs which will allow you to display them standing or seated. The stand approximately 13" tall. The girls are dressed in a red or green pinafore dress with white lace trimmed bloomers underneath and a coordinating shirt. 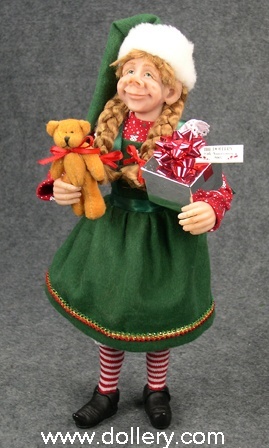 They hold a silver gift box with a "Dollery 25th Anniversary" tag and a bear. 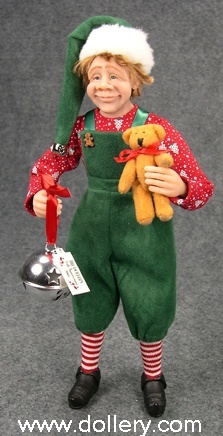 The boys are dressed in red or green overalls with a coordinating shirt and are holding a silver bell with a "Dollery 25th Anniversary" tag and a bear. 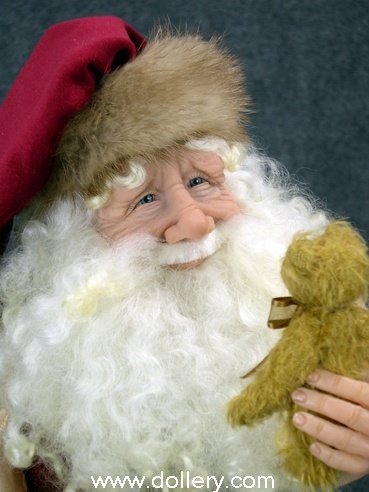 <?fontfamily><?param Arial Narrow><?bigger> Taking one last look, this 19” Santa holds a mohair teddy bear. With an assortment of toys at his feet, he wears a paisley print vest with gold shirt, green velvet trousers and red velvet hat. Blue eyes add to his gentle expression. Handsculpted polymer clay face, resin hands and boots. 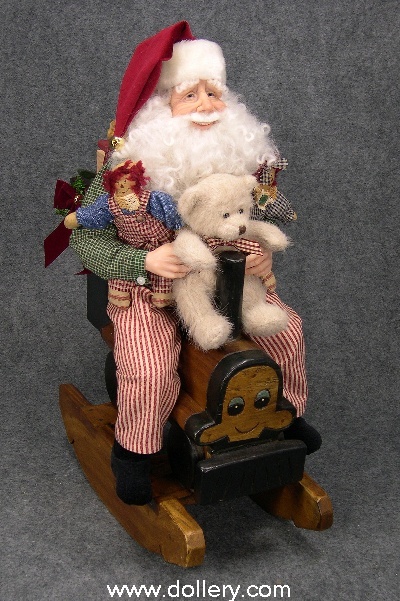 Santa is seated on a wooden rocking train and comes complete with a boy and girl rag doll and a bear. 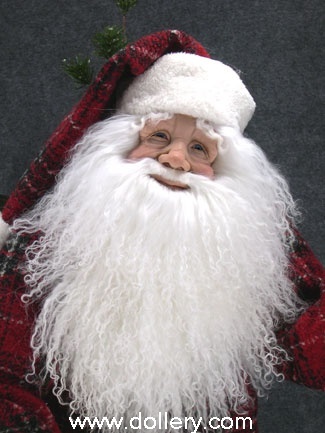 This 24” jolly Santa has green glass eyes and wool beard. He is dressed in a jeweled tone red crushed velvet coat trimmed in black persian lamb fur, paisley shirt and gold and red striped trousers. 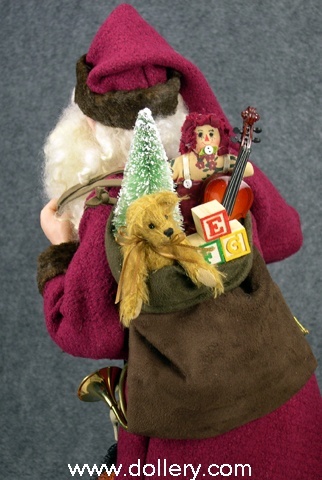 He carries a sled, bear, wheeled lamb toy, porcelain doll, garland and container with berries. Handsculpted polymer clay face, resin hand and boots. 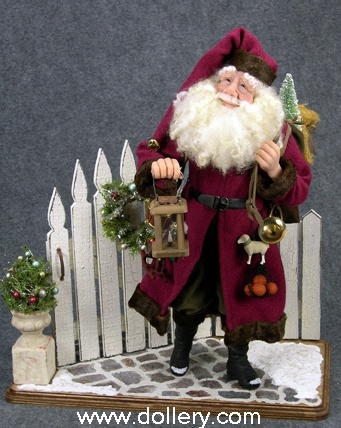 This 18” Santa is walking down a faux stone path with a gate and fence as his backdrop. He carries a bag of toys over his shoulder and a lantern. Tied to his belt are assorted toys. Dressed in a burgundy coat trimmed in faux fur and green trousers he has blue glass eyes and a wool beard. Details abound in this unique piece. Handsculpted polymer clay face, resin hands and boots. The base measures 9” x 16”. 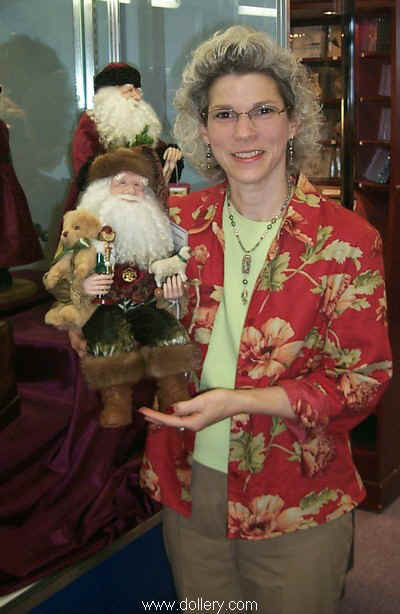 Diane Troutman at our 2005 Doll Show! This 18" Santa is smiling big seated on a wooden rocking train. He is dressed in red and white overalls and a green and white plaid shirt. He is holding boy and girl rag dolls and a bear. The train is decorated with greenery, bows, and toys. He has a hand sculpted polymer clay face with blue glass eyes, resin hands and wool beard. gold shirt trimmed with gold lace and green silk velvet trousers. dimensions are approximately 21" high x 13" wide x 9" deep. 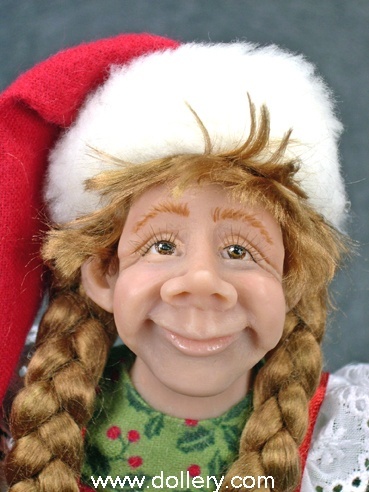 This would be amazing around a Christmas Tree! You can separate cars to display separately. 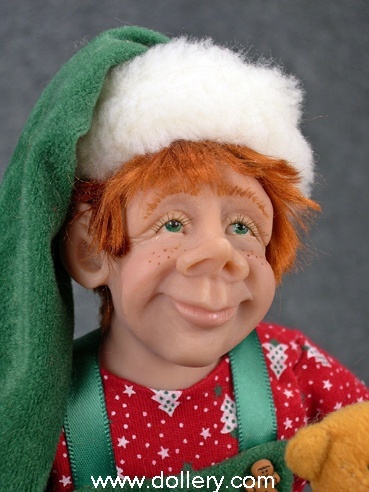 Elves hats are trimmed in fur! 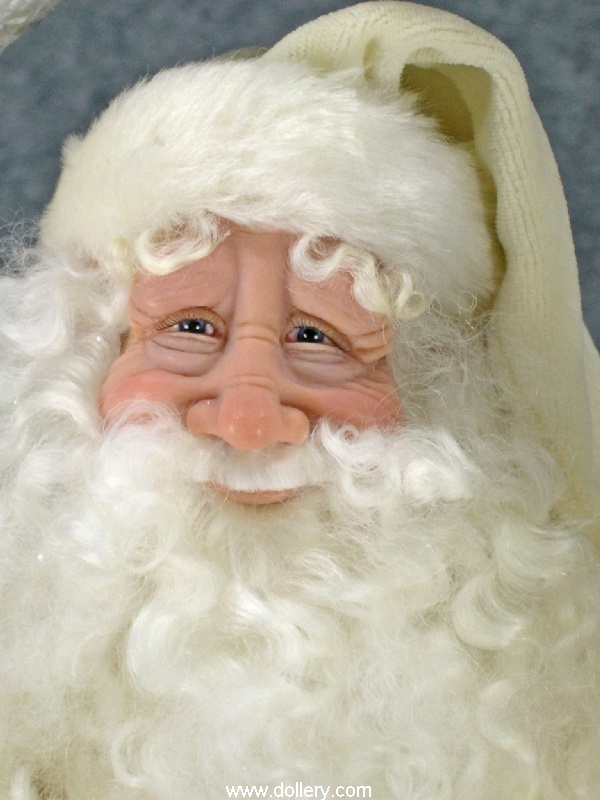 24" Santa has a handsculpted polymer clay face with blue glass eyes, resin hands and Tibetan lamb beard. 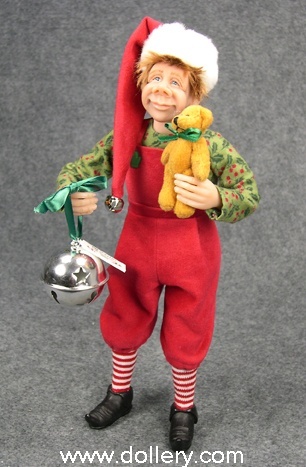 He stands on a wood base full of toys and holds a doll, pocket watch, teddy bear and hand sculpted jester marionette. 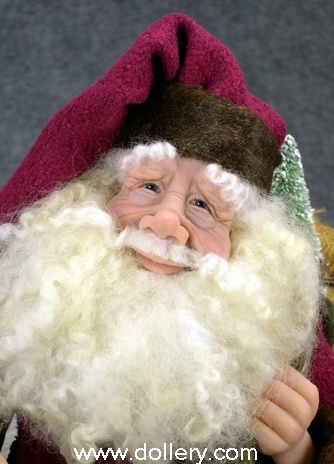 21" Santa has a handsculpted polymer clay face with blue glass eyes, resin hands and Tibetan lamb beard. 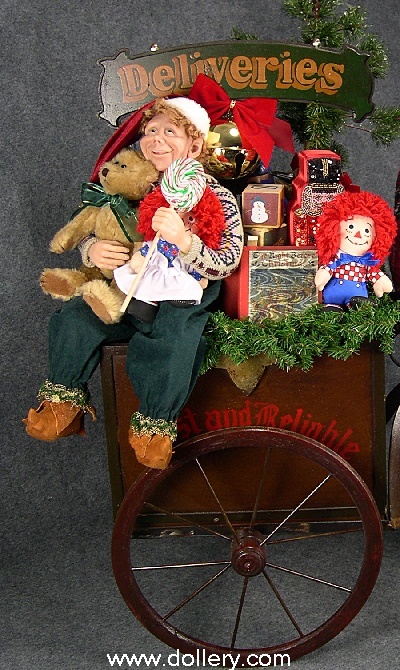 He is seated on a reproduction handcarved wooden rocking horse and holds a doll, bear, nutcracker and horn. Overall dimensions are 30" high x 12" wide x 24" deep. 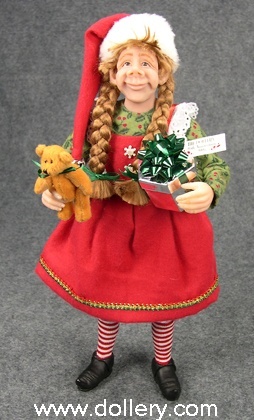 This smiling 21" Santa is seated on a fabric box. Dressed in green trousers, a cream colored print shirt and multi-colored tapestry vest. His hat and boots are trimmed in mink fur. He holds a handmade Jack in the Box. 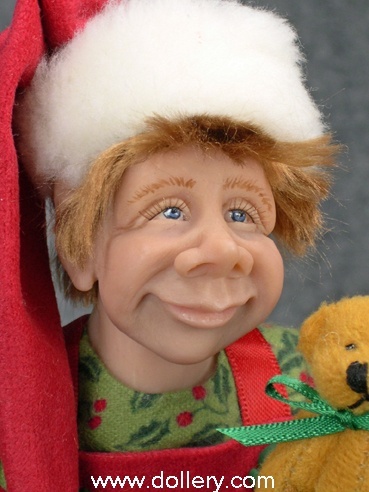 He has a hand sculpted polymer clay face with green glass eyes, resin hands and mohair beard. Inspired from a vintage postcard, this 21" blue eyed Santa is dressed in green trousers and a burgundy coat trimmed in black Persian lamb fur. He carries a Christmas tree and holds a walking stick. Over his shoulder is a birch bark bag with toys. He has a handsculpted polymer clay face with blue glass eyes, resin hands and wool beard. 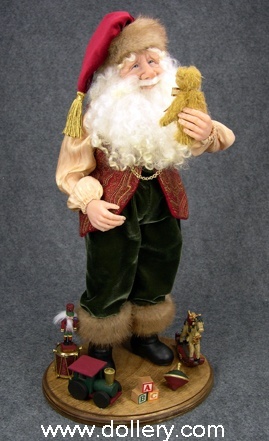 This 21" Santa is dressed for the outdoors in a green tapestry coat trimmed in fur and green trousers. He has fur boots and a fur hat to match. Holding a walking stick with an owl perched on top in one hand, he carries a bag of greenery and pine cones in the other. Over his shoulder he carries his snowshoes. 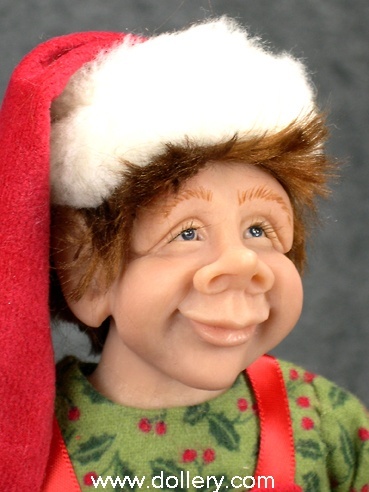 He has a hand sculpted polymer clay face with green glass eyes, resin hands, and wool beard. This 21" Santa is getting a ride from a plush polar bear. He is dressed in a tapestry coat trimmed in fringe and gold pants. 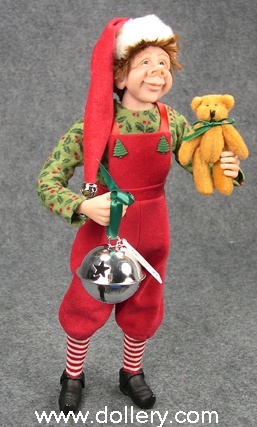 He holds a bear and bells in one hand a a bag of greenery in the other. He has a hand sculpted polymer clay face with blue glass eyes, resin hands and Tibetan lamb beard. Overall dimension 24" high x 14" wide x 21" deep.